In his early days Cross cultivated a sombre and realist type of painting with thick impasto, following the style of Gustave Courbet and François Bonvin, who looked to the pictorial traditions of Holland and Spain. But from 1883-1884, under the influence of the Impressionists, Cross turned to outdoor landscape, deploying a light palette and loose brushwork. During this period he came into contact with Signac, then Seurat, Angrand and Dubois-Pillet, who formed the neo-Impressionist group. In 1890 the artist spent time in Chamouilly, a village in the Champagne-Ardenne area of the east of Paris, where he painted a series of landscapes and country scenes, including the present work. 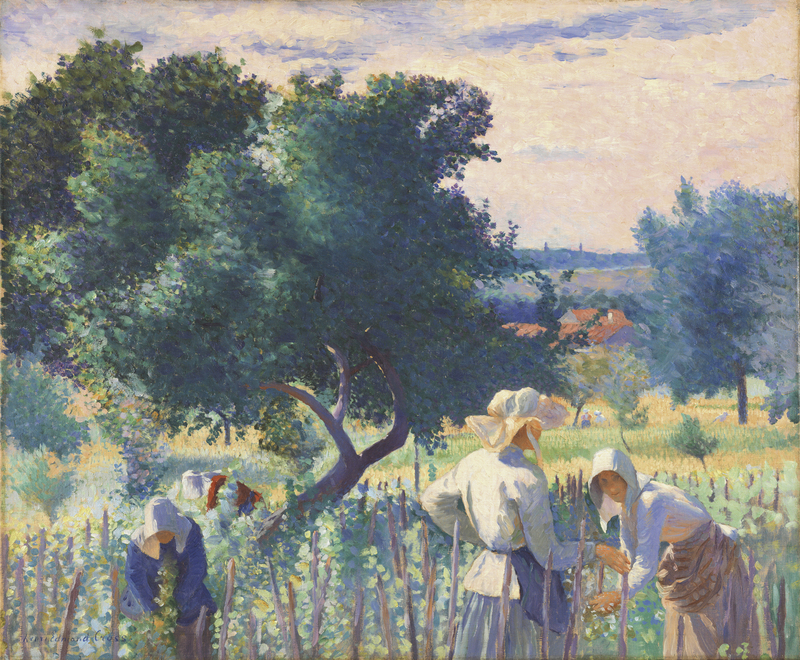 Here, the predominant influence is that of Pissarro, the only one of the Impressionists who continued the paysanneries tradition, although without the almost religious sentimentality of Millet or Jules Breton. Pissarro's interest in rural workers was related to his anarchist beliefs which Cross, like Seurat and Signac, also came to hold. In 1886 the critic Fénéon defined Cross's style in the following words: "a light palette, objects, beings indicated with flat colours, light brushwork, a pretty fantasy." 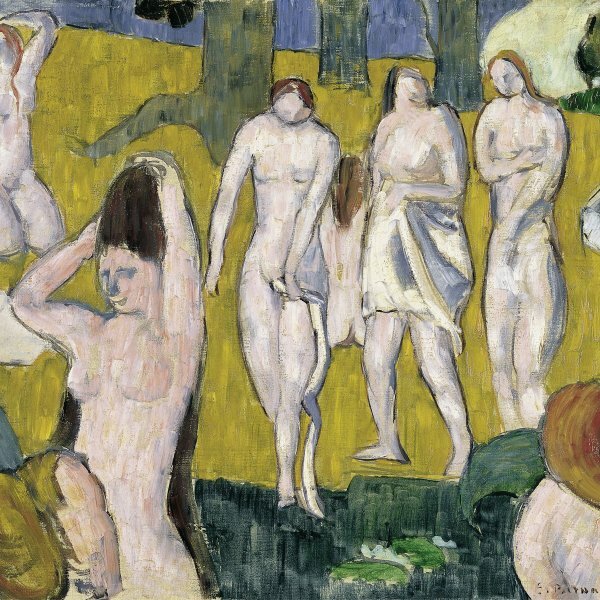 These flat, toned-down colours (mixed with white) are here displayed above all in the traditional bonnets and in the bodies of the women bent over in the sun. In contrast, the pink stippling in the dark green mass of the tree is already a response to Divisionism, in an effort to render the glints of the complementary colour that appear on a coloured surface. The painting was shown at the Salon des Indépendants in March 1891 as was the first work (a portrait of his future wife) in which Cross used rigorous neo-Impressionist techniques. Cross donated this painting to a charity auction held in Paris on 9 May 1885 in aid of the painter Lauzet, who was ill. Decades later it came to form part of the collection of Henri Canonne, one of the great collectors of the inter-war period.